Long distance relationships stink. Anyone who’s ever gone through one will tell you: They are hard and most of them don’t work. Hey, relationships are tough no matter what. Add distance to the equation, and you are almost doomed. You wouldn’t make a relationship with someone you loved long distance on purpose, would you? Why make a relationship harder if it doesn’t have to be? You want the person you love as close as possible. If it was in your power to close that gap, you would. Right? 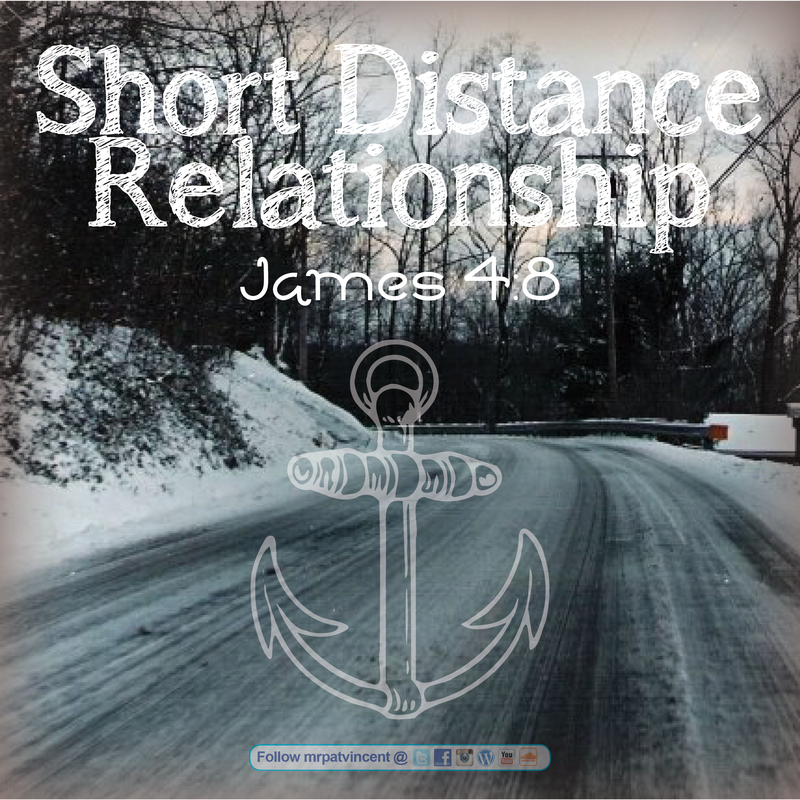 Jesus wants a close, SHORT DISTANCE relationship with you. He wants to be the first person you turn to in need. He wants to be there to comfort and guide you. He doesn’t want to be a world away. He doesn’t want to be the fourth or fifth or sixth person you go to. He knows what’s best for you, He knows God’s plan for you, and He wants nothing more than for you to succeed… so He can spend even more time with you. It is you and I that create the distance. I say, “create,” because, it isn’t there until we put it there. We disconnect. We disengage. We cut the lines of communication. Jesus is always there. Always waiting. Always hoping. He is there waiting and hoping that we reach out to Him. Skype is cool. Facetime is really neat. But there’s nothing quite like spending time with someone in person. Long distance relationships stink. Jesus doesn’t want that. James 4:8 says “Draw near to God and He will draw near to you.” It’s in your power to close the gap. All it takes is that first step. This entry was posted in Christian and tagged Bible, Christ, Christian, Christianity, church, close the gap, communication, create, Creation, daily planner, David, disconnect, disengage, Draw Near, Draw Near to God, facetime, Faith, God, God Bless, God Loves You, God's love, Good news, Gospel, Heart of David, Holy Spirit, Hope, James, James 4:8, Jesus, Jesus Christ, liveforJesus, long distance, long distance relationships, Lord, Love, Ministry, new testament, Not a Fan, Old Testament, Pastor, practical application, prayer, Preach, Psalms, relationship, relationships, Religion, Religion & Spirituality, resurrection, Salvation, Scripture, short distance, skype, son of the living God, spiritfilledlife, spiritualwarfare, standing in the gap, Trinity, twor, Twurch, Worship, writing. Bookmark the permalink.